Indoors - Located just to the southwest of Paris city limits, in the town of Boulogne-Billancourt. The ice is hard and well maintained. 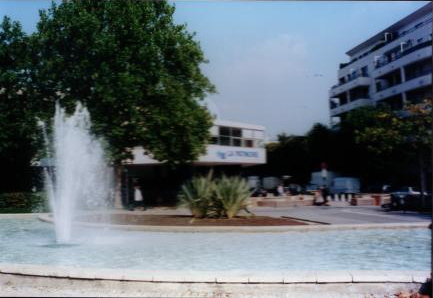 Outside the rink is a nice park with picturesque fountains. However, this is barely visible from inside. 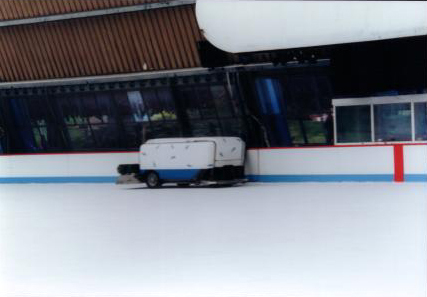 As at the other rinks in Paris, skaters are not permitted into the building until the session begins - so you will lose ice time getting your skates on. The "long" line and slow pace of people paying their admission to get in frustrated many regulars, some of whom jumped ahead, because they had pre-paid membership cards or something of the like. This was a Saturday morning session which had mostly figure skaters. Just about everyone knew each other and they seemed to spend more time kissing each other on the cheeks (European style) than skating. In the middle of the session all skaters were instructed to leave the ice; for the next 20 minutes there was music for ice dancing and many pairs skated. Take the metro line 9 (direction Pont de Sevres) to Marcel Sembat. There is a skating school if you want lessons. 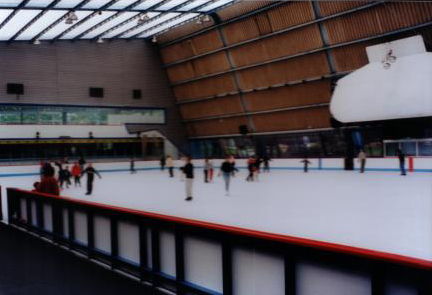 There is a dance school above the rink with a view of the ice as well. Skate rental (hockey and figure) is also available. There are vending machines and a casse-croute (snack bar). There are coin lockers but most people left their stuff on the bleachers. See the Patinoire de Boulogne Billancourt web site for more information, including the schedule and prices. Last updated Aug 25, 2007.